In the struggle for public education, we often neglect the student as a potential agent of change and the keystone of free-market education reform. The ground under education reform is beginning to shift. Families, chafing under years of state and mayoral control, are demanding a return to democratic processes. There’s the feeling of something lurching under the public education system, and with it our understanding of how resistance should look in the years to come. As high school students take to the streets, unions must do the same or fade into irrelevance. Two incisive essays on education reform in the latest issue of Jacobin attempt to situate this moment ideologically and historically. In “The Strike that Didn’t Change New York,” Megan Erickson surveys contemporary teacher unionism and asks how resistance to elite education reform can transition from disparate local actions to a “unified national agenda.” Shawn Gude, in “The Industrial Classroom,” examines the parallels between contemporary education reform and industrial reforms of the late 19th century. Their essays come at a crucial time. Chicago has just announced the largest mass closing of schools in American history. Unions everywhere face implicit threats of charter school proliferation and increased test-based evaluations, as well as the explicit threat of losing collective bargaining rights. But Gude’s and Erickson’s prescriptions for combating the neoliberal juggernaut fall short of comprehending the modalities of resistance. Gude begins with the recent developments at Garfield High School in Seattle, where teachers have boycotted MAP, the state standardized test. They share their anti-testing sentiment with other “dissident teachers” in places like Chicago, where the Chicago Teachers Union led a historic strike last fall. Gude examines the effects of free-market reforms spun from the same yarn as standardized testing: “vapid” curricula, increasingly “data-driven” evaluations and a torrent of Teach-for-America-style neophytes bringing deprofessionalization in their wake. He finds a “special resemblance” between these policies and Taylorist industrial reforms of the late 19th century, which aimed to reduce human labor into its mechanical essentials for the assembly line. Both Taylorism and corporate education reform seek efficiency through rote, deskilled processes that discourage unionization and alienate workers. Megan Erickson advocates for precisely this kind of unionism in “The Strike That Didn’t Change New York.” She begins by untangling the 2012 New York City school bus strike. It failed, she says, due to a public perception of acquisitive and self-interested bus drivers leaving children shivering on the street. In such a stratified, unequal society, she argues that unions must reject “business unionism” and its narrow, bread-and-butter concerns with salary and benefits, and embrace “social movement unionism” and its wider concerns with social and economic justice. Absent in both articles, however, is a full reckoning of the student as radical subject. Like many other writers on the left, they reflexively overlook the student both in the theoretical sense as an agent of change, and practically as the keystone in the architecture of free-market education reform. But their essential arguments relegate students to the back seat. At best, they cast students as allies in resistance; at worst, as mere recipients of humanitarian concern. Erickson, answering the “what is to be done” question of public education, deals solely with unionism. Although she argues persuasively that unions’ prerogatives must extend beyond the classroom and into segregation and mass incarceration, she holds up the union as a privileged source of activism. Students are generally as aware of their teacher’s union status as they are of her shoe size. It’s not visible to their lived experience. A union can shrink classes, secure resources, even keep schools open, but this happens behind closed doors. Being fundamentally teacher-driven, Erickson’s solutions relieve students of their agency in resisting corporate reforms. Gude also concentrates on union organizing to the exclusion of other forms of democratic engagement. In doing so he commits a rhetorical pitfall many school advocates suffer: too closely relating contemporary school reform to scientific management. As Gude admits, the analogy bends when one acknowledges students as subjects, unlike the raw materials that are their corollaries in the factory. That exception, however, bends the analogy to the point of breaking. The dual subjectivities of teacher and student make education a form of labor sui generis. The student confounds the management-labor dialectic. If like Gude you brush this aside as a caveat, the industrial analogy can be briefly instructive; Gude is dead-on when he ascribes corporate reform policies the same force as an assembly line. But asking teachers to model their resistance on that of factory workers (whose products can’t say “no” on their own), partakes of the industrialist thinking that turned students to objects in the first place. Meanwhile, reality belies the contention that “only organized workers can thwart the agents of dehumanization.” Public school advocates generally don’t look to the right-to-work state of Texas as breeding ground for resistance, but it was there that the grassroots Texans Advocating for Meaningful Student Assessment, among others, successfully petitioned the state government to halve the number of standardized tests. This, in the state where No Child Left Behind was conceived, where teachers have no unions. But there are better historical precedents. In 1913, New York City was a hotbed of education reform. High society types and industrial magnates, urging reform of the tangled school system, chanted the mantra of efficiency. That year John Purroy Mitchel was elected mayor of New York City. “An amiable man, but without character or principles,” as William Hearst sketched him, Mitchel was animated by a “progressive passion for business-like efficiency” to reform the schools. Championing the program was the Rockefeller Foundation’s General Education Board, whose founding literature assured the public, “In our dreams, people yield themselves with perfect docility to our molding hands.” Despite the plan’s connections with the Rockefeller Foundation and its provenance in a town built for factory labor, the Gary system delighted liberal elites, who held that schools should “meet the practical demands of industry.” Even John Dewey, who was issued the first New York Teachers’ Union card in 1916, sang its praises. With Mayor Mitchel’s efforts, schools throughout New York underwent Gary-ization. Meanwhile, parents and students, particularly low-income immigrants and Jewish families, organized to resist the reforms. While upper-crust humanitarian leagues sponsored automobile rides to Garyized schools, the parents there organized opposition groups, like the Mothers’ Anti-Gary League in Brooklyn. A few weeks later, Mitchel lost the vote to John Hylan, who on the first day of office canceled the Gary plan. Mitchel joined the Air Force as a major and was killed in a training mission. Activated by politicians, parents and their own disaffection, students disarmed “reform” as surely as any teachers strike then or since. While unionized factory workers were resisting Taylor in the workplace, students were resisting Rockefeller on their own terms. What Gude, Erickson and others have treated as a political issue must become instead a pedagogical one. The dual liberation of teachers and students from neoliberal reforms and their effects must be conducted by and for students. Freire wore out his boot-soles traveling South America holding seminars for peasants. Though he possessed a university education, he insisted that the educational work of consciousness-raising must be conducted as between equals if it is to be humanizing. Walking into an American school today, Freire would plunk into a desk and ask students directly about the conditions that oppress them. What makes them afraid between school and home? What policies rob them of their dignity or stifle their creative spirit? What conditions would they change if they had the power? From there his questions would become critical. Why are things structured this way? Who benefits from this unjust order? Freire writes, “There is no true word that is not at the same time a praxis.” If we take the shopworn phrase “critical thinking” seriously, teaching is a revolutionary act. Once a student can speak truly to her temporal surroundings, she can act to affect them. If progressive teachers embrace this notion, each school could be a microcosm of the larger struggle to preserve public education. The political center of gravity must be moved back towards the student. They can and will make their own waves. In Denver, students walked out to protest standardized testing. In Newark, N.J., nearly a thousand students demonstrated against budget cuts under Gov. Chris Christie. 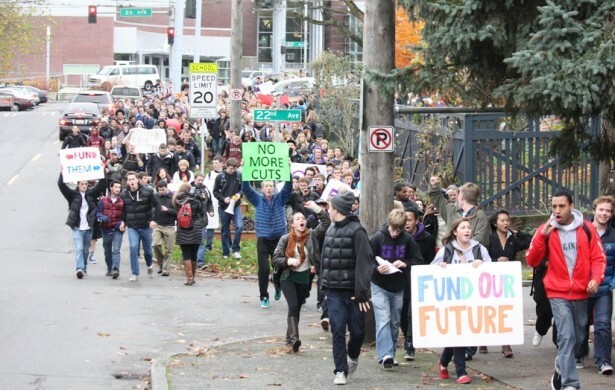 In Portland, Ore., students have initiated a campaign in opposition to standardized tests and demonstrated against them. In Rhode Island, the Providence Student Union delivered a “State of the Student” address, outlining its opposition to high-stakes testing among other issues. But nowhere has student organizing been stronger than in Chicago. Gude and Erickson are correct in praising the CTU. With its spirited advocacy of student welfare, reflected in their rallying cry, “Our teaching conditions are our students’ learning conditions,” it should come as no surprise that student activism has become pandemic. Finally, there’s nine year-old Asean Johnson, who in the process of maybe saving his school gave opponents of mayoral control pause in consideration of his eligibility for office in a dozen years. Each of these demonstrations owes at least part of its impetus to the CTU’s monumental efforts. But student actions can’t be understood as a simple epiphenomena of social movement unionism. Ideally, both would contribute towards the common aim of a humanizing education — in the process emancipating both teachers and students. In the ecology of public education, no component involves more energy than students. Every year, that energy condenses into the standardized tests that students from third to 12th grade must endure. On that joint the entire weight of No Child Left Behind leans. From those bubble sheets all “failing schools” rhetoric draws its empirical sting, every narrowing of curriculum finds its justification. And it’s there that student resistance to free-market reforms could be most keenly felt. Just last month, the Seattle school district announced that the state MAP test would be optional at the high school level. It’s a near-complete victory for the teachers at Garfield High School, who initiated the “Scrap the MAP” boycott with help from students and parents. An organizer of the boycott, Jesse Hagopian, justified the action in stark political terms: “[The] whole system of ed-reform rests on these data points, on reducing teaching and learning to a single score that they can use to close schools.” Advocates around the country are singing the same tune. The conditions of the testing system are the conditions of a well-honed oppressive order. The danger of losing their livelihood turns teachers and administrators into sub-oppressors, overseers deferent to district leaders and corporate interests in a stultifying “simulacrum of education,” as Gude puts it. The students suffer a dehumanizing litany of drills and “skills,” together with failure anxiety that lasts weeks, months and years. This puts “Scrap the MAP” and its ilk at the vanguard of resistance to corporate school reform. The method resists oppression at the precise moment of its application, the standardized test. It blunts reformers’ sharpest weapon against teachers. It destabilizes the infrastructure of the profitable education-services economy. More crucially, test resistance enables students, the primary objects of oppression, to be the agents of their own liberation. Radical educators must alert students to this state of affairs. If classes are sufficiently safeguarded from administrative sanctions or fortunate enough to endure penalties, they ought to join in common resistance. It could look like this. After months of rich curriculum of the teacher’s choosing, she brings up the imminent spate of standardized tests. In preparation, the class embarks on a research project. One group examines how the tests came about and who manufactures them. Another group explores alternative assessments. Yet another undertakes a sociological investigation into standardized testing’s effects on pupils. Each group presents its findings, and students and teacher alike reflect on their experiences with standardized testing. The class votes. Do we take state-mandated tests this year, or only the evaluative methods we and our teacher deem appropriate? Maybe students vote for the tests. In the event that they don’t, the class can determine a better way to spend its time, perhaps in a demonstration or presentation of their findings to relevant authorities, whose interest at that point will likely be piqued. The critical flaw of accountability-based reforms lies in their view of teachers as machines capable of more or less effectively cultivating student learning. But teachers do not grow students; education involves the entwined development of both. Any roadmap for meaningful resistance, then, must think beyond the paradigm that predicates all activity on the teacher. It must instead imagine a movement that swells organically from the ground — that is, from the student. Owen Davis is a writer and educator who lives in Brooklyn, NY. He currently writes curriculum for IndyKids and works as an intern at The Nation. Fascinating piece! Just wanted to note that anti-testing sentiment was a big part of the initial push toward teachers’ unionization, in 1897 in Chicago, and through the progressive era till today. I think teacher protests have always been concerned about pedagogy, though after the introduction of collective bargaining in public education (1960s), those issues often took a backseat to bread-and-butter organizing around wages and benefits. Hey, thanks! I didn’t know about the history of testing and unionization in Chicago. Just found your blog post on it, though, very intriguing. I’m kicking myself for not stumbling across that sooner. Looks like I have some recommended reading to do. Great post–really enjoyed the NYC history of the Gary System. I never knew about it; but I’m not entirely surprised that history, once again, repeats itself. to be a entertainment account it. Glance complex to more added agreeable from you! presentation but I find this matter to be really one thing that I feel I’d never understand. I am looking forward for your next post, I’ll try to get the grasp of it! foresee issues prior to these people occur.